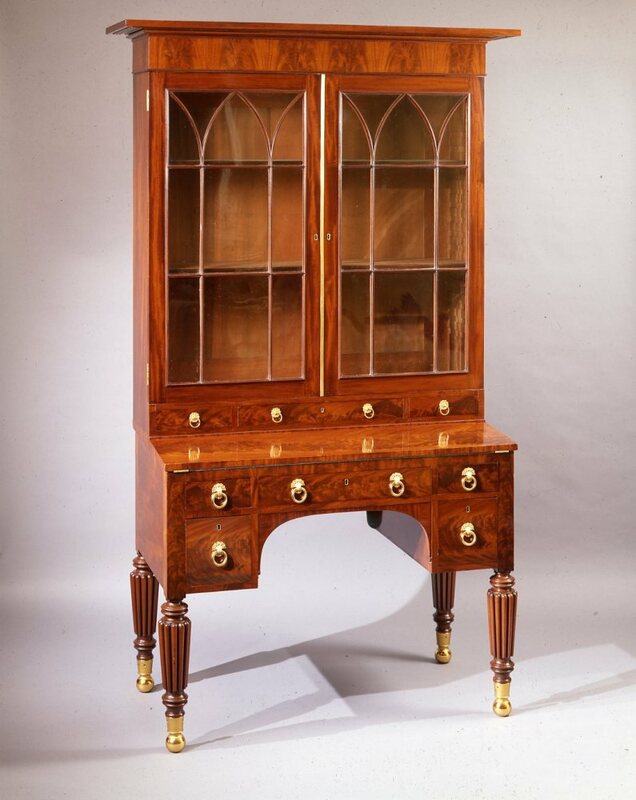 Comprised of two parts: The projecting pediment top above a veneered frieze above a pair of glazed cabinet doors with Gothic tracery opening to four fully adjustable shelves, over three short drawers with original brass pulls; the lower case with a hinged flip-out writing surface above a central long drawer flanked by short drawers above an arched knee hole flanked by square drawers all with original brass drawer pulls. The legs are turned and heavily reeded, terminating in brass socket ball feet. CONDITION: The piece survives in almost perfect condition with only minor restoration to veneer on the lower left drawer. Re-surfaced with shellac in the manner of the period. The brass hardware is restored to its original bright and matte lacquered appearance. This rare secretary is closely related to one made for Thomas Lattimer Bowie that bears the label of Duncan Phyfe. The labeled secretary is identical in form to the present example but has a scrolled broken-arch pediment surmounted on the top. A second closely related example of a flip-out desk secretary was made for Mary Telfair and is documented to Phyfe in an 1816 letter to her friend Mary Few. A third flip-out desk example is in the collection at Boscobel. A fourth related secretary is known with tapering veneered legs and with brass ferules on the front feet only. 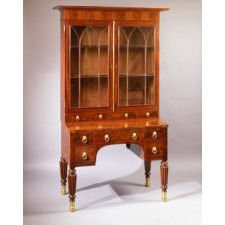 The reeded Sheraton legs with carved paw feet of the Telfair secretary link it to a roll-top or cylinder secretary in the collection of The White House which, in turn, is linked to a cylinder secretary at the Metropolitan Museum of Art. Three additional cylinder secretaries of this type are known. Experts consider all of these to be by Phyfe. Peter M. Kenny and Michael K. Brown, Duncan Phyfe: Mater Cabinetmaker in New York (New York, The Metropolitan Museum of Art, 2011), p. 198-9, pl. 25. Page Talbott, Classical Savannah: Fine & Decorative Arts 1800-1840 (Savannah, Telfair Museum of Art, 1995), p.126-7, fig. 65. Berry B. Tracy, Federal Furniture and Decorative Arts at Boscobel (New York, Boscobel Restoration Inc., 1981), p.107, fig. 74. Betty C. Monkman, The White House: It's Historic Furnishings and First Families (Washington, DC, The White House Historical Association, 2000), p. 267. 19th Century America (New York, The Metropolitan Museum of Art, 1970), pl. 20. Measurements H: 86" W: cornice: 51�" case: 45" D: 23"